The 2013 Nissan pathfinder is an all-new vehicle for Nissan, however it is not unique in the Nissan family. Historically, the Nissan Pathfinder was a brute-‘ute. It evolved into a large, tough, body on frame utility vehicle. The fuel economy was poor, the performance was mid-pack at best, and all the competitors had moved on. 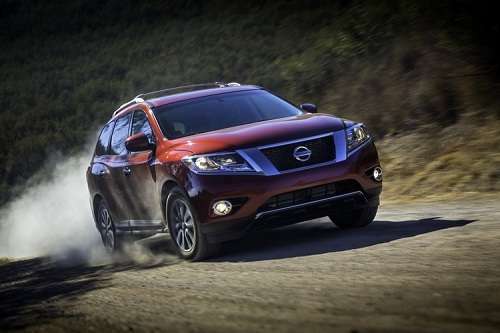 Although Nissan had the Murano, which like the Maxima is a luxury vehicle sold by Nissan, the company wanted a vehicle more competitive with the Toyota Highlander and Honda Pilot. That means 3 rows of seats, V6 power and mid-range luxury and safety features that really work. Nissan created a vehicle to do all of this and it came to market this spring as the Infiniti JX. Now Nissan has launched the Nissan brand version of this vehicle and it is called the Pathfinder. With impressive fuel economy and 7 seats the platform is poised for success. A close examination by Torque News of the content of the Infiniti JX and the Nissan Pathfinder side by side reveals that they are indeed the same vehicle. By all appearances the drivetrains are identical. Both have 3.5 liter V6 engines, CVT transmissions, and all-wheel drive is optional. Interestingly the Infiniti has 5 more horsepower. That could be strictly marketing or it could mean the ratings for the Infiniti were on higher octane fuel. However, Infiniti does offer optional safety equipment that is not yet available on the Nissan version. Also, the luxury items are very close in description, but not exact. For example, the premium Bose audio system in the Pathfinder has 13 speakers with the “Exclusive” Bose Waveguide system, and the Infiniti has 15 speakers with 5:1 channel decoding. Buyers would have to sample both to see if there is a difference to them. The similarities are more numerous. Both offer a large panoramic sunroof as an option, and both have climate controlled front seats (heated and cooled). Nissan’s Murano is a five-passenger vehicle with similar equipment to the new Pathfinder. It has good looks, but will that help it to overcome the fact that it seats less people and has a very similar specification sheet when compared to the new Pathfinder and is priced almost exactly the same? Hyundai’s new Santa Fe had a similar issue until its newest release of the Santa Fe. Instead of competing with its own other models, Hyundai decided to offer a Santa Fe in two wheelbases. That way it can sell a “Santa Fe” with either 5 or 7 seats to buyers in the showroom. The new Pathfinder will start out at just under $30K for a base 2WD model, but will reach the low $40K level when outfitted with all the premium content offered and all-wheel drive. The Infiniti JX by comparison starts at this same $40K level and can be configured to reach almost $60K when similar equipment to the Nissan pathfinder is added. Nissan has only shown us MSRP listings for the various trim levels at this point, so look closely when all options are fully priced out. Regardless, the Pathfinder is a very hard vehicle to ignore if one is shopping the JX and the buyer is not planning to buy all the optional safety and electronic nannies. The 2013 Nissan Pathfinder is a big step forward for Nissan. If Toyota and Honda hope to keep their sales figures where they have been it is time for those companies to do some soul searching.